3” diameter dust take-off with actuated butterfly valve and filter screen vents displaced air. 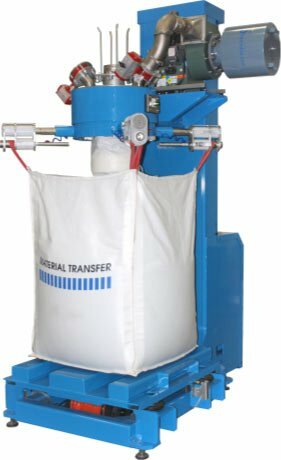 Automated electric bag inflation system with filter removes bulk bag creases for maximum fill volume. Hydraulic Power-Lift™ system positions fill head for ergonomic bag connection of various size bulk bags. Power-Lift™ system with 30” of travel can be programmed for automatic bag stretching, including full bag lift capability. Stainless steel flexible hose guide system. Inflatable spout seal is actuated by an ergonomic lighted push button. Unit features a heavy-duty, high output, densification system with variable frequency drive to settle material during and after fill cycle.